I heard that you took up a bank job so you could pay the bills for the living and pay the filmmaking cost too. It always amazes me how far determination takes us along. Can you tell me your story in more details? When I left college, I was very disillusioned with the education system. From my experience, it is a terrible place to foster creative talent. So I decided not to go on to further education but instead got a job and earned some money. The only thing I could get at the time was in a ‘bank’ or finance company if you will but either way, it was incredibly boring. But for the first time I had some money to play with. So over the course of about a year I saved up and bought a PC, capture card & a DV camera, which is pretty much all you need to start making movies. I made dozens of short films and just learnt the basics from there by making film in the evenings and at weekends. I have had no formal film training I’m pleased to say. The story on how Ninja Man grew from the 1-minute version to the 12-minute version, then to the full version is amazing too. Well basically I had this idea for a sketch which we filmed one afternoon in which a man is walking down the street, a little girl asks him for a cigarette but instead of giving her one he decides to punch her in the face and run off. In the edit, Oliver came up with the idea of adding a funny voice-over and giving the main character a weird twitching sound. So that one-minute film was called ‘Ninja Man’ and was really popular with the people we showed it to. It also did rather well in a Camcorder User competition and got us a very nice three-page article with them. We knew we had a really funny and interesting character we could develop so we thought up some other short sketches for this character which we largely improvised with friends, but which generally ended in Ninja Man beating someone up, normally without much of a reason. Eventually I assembled these films together and that became ‘The Seven Days of the Ninja’, with each of the sketches being a day in the life of this wandering homeless ninja. The film got screened at various underground film nights with a great response, and it was also shown at the Raindance Film Festival. But it wasn’t until it got included on the cover of Total Film magazine’s cover CD that I thought the film might have potential to be developed into a feature length project. Within a year we would be screening the finished feature at the National Film Theatre in London. How much did it cost to make Ninja Man? We didn’t have to pay for much on Ninja Man. Ater the general costs for all the DV stock and props, the final tab was probably around £500. But really the budget of a film is only relevant if it’s making money, which Ninja Man has not done yet. But that’s not why we made it. Obviously none of the actors got paid on the film, I didn’t pay for any of the locations, I owned or borrowed all the equipment I needed. But of course given a proper budget I could have shot the film to a commercial standard and I’m certain it would have made money, but none of the film funding bodies have the mechanics in place to fund a film like Ninja Man. Were they all your friends? Everyone "acts himself / herself"? The cast of about 36 were mainly actors in fact. All the lead parts were played by professional actors, except Ninja Man & Shells’ character. I learnt a long time ago how much better professionals are to work with than amateurs. Though there are a lot of minor, walk on parts, which were played by friends. You just have to play to people’s strengths and not try and make them ‘act’ too much. 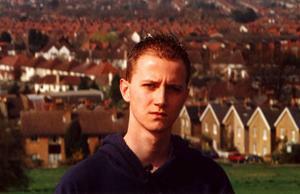 Alex Shane, who played the main baddie, the Evil Ninja Gardener, is one of the top British wrestlers in the country. I was very lucky that I was going to be doing some filming work at a sports event he was in, but I had to pull out cause I was doing an audition for the parts in Ninja Man. When I told the organiser, he told me that a lot of wrestlers would probably be keen to be in my film. So I gave Alex a call and sure enough he was! A feature length production must take months to make. How did you maintain continuity? Did you need to ring up your actors and ask them to have hair cuts? Continuity was a problem at times, I’m sure people’s hair lengths do vary from time to time in the film but there’s nothing major in there. And if people want to pull me up on continuity errors then they need to get out more. Did you need to direct Oliver at all? How much of the action is not in the script? Every element of the performance was directed. Oliver can’t really ‘act’, but he can do characters if you know what I mean. So I had to think of the best way for that character to do things. Quite often we changed the script and improvised some dialogue just to keep his performances fresh. But no one else really improvised, they had a perfectly good script to follow I guess. Did you keep a production diary which would tell us the scale of the project? Well, we started on 2nd September 2001 (my 21st birthday) and the premiere at the National Film Theatre was on the 20th June 2002. Considering everyone involved had a full time job and other commitments, this is pretty good for an 83-minute film. On the Ninja Man project I kept a detailed diary. I started in December 2001 and it went on until the end of the film. I think there were 25 hours of rushes. Did you complete the script before you shoot? Did you edit before you finish shooting? As they say, ‘There is no such thing as a finished scripts, only finished films’. Of course I changed things as I went along to suit the reality of each days filming. Once you’re at a location and you have everything in front of you have to do what a director does and ask ‘is this working’ and if it isn’t then making the necessary changes to make sure it does. I’ve worked on film-sets and watched so many directors failing to do this, only the director can change things so it’s important he doesn’t get lazy and just follow the script. It’s the worse thing you can do. There were a few rewrites to the film as well. Originally all the stuff in the office and the actress playing his girlfriend were different - in fact it was pretty awful. Because I didn’t audition the actors properly, I paid the price. But being able to come back to those scenes with a new script and new performers was great, I think we got it right second time round. And I’ve certainly learnt my lesson about getting the casting right. I asked this before, but I like to see us discuss about this in the article: Was the bloody scene with the martial art instructor necessary? Yes. I’ll come back to this point. Since the feature length version grew from the short film, do you think there was a problem that you might keep too much existing materials and somewhat affect the flow of the film? I personally feel that the film was not advancing at the middle part. Sure I know the film wasn’t as tight as it could have been. And it was my first attempt to do anything as long as that. On the other hand, I was very aware of the standard narrative progression, which I didn’t want to imitate. The Ninja Man character is pretty unique so the standard narrative logic just didn’t seem to fit. I kind of wanted to do something with a really menial plot, which would just move you from one fight to the next, I wanted it to be fun to watch. The actual ‘story’ takes 60 minutes to kick in. I love that, personally I think we get away with it. Look at the end line, it’s a small story of small people. It’s about the monetary of our day-to-day lives and the suburban madness it breeds. There is no major earth threatening plot line - it’s small stuff and I like that. Michelle is really great. I don't know if you want to say something about her. Did she have her special hair style with a touch of red throughout the filming period, or was it a make up? Part of the reason I cast Michelle is that she already had her great Goth look, which I knew would look great in the film. And I also like the fact that she is really laid back and cool. For some reason I find the idea of a schoolgirl using her lunch break to smoke crack extremely funny. Are the friends around Ninja Man a true representation of today's young generation? No, but it is a true representation of what makes them laugh, which going back to the martial arts instructor scene - it’s just so stupid what happens you can't possibly take it seriously. He challenges a martial arts sensei to a fight cause he can't be bothered to undergo years of expensive training and wants to get the black belt to impress his girlfriends. So he has the fight with the sensei, she beats him up, so when her back is turned he slashes her throat with a knife. Then when he leaves the martial arts studio with the girls he throws the black belt in the bin and they go to the pub to celebrate. This is a such a stupid scenario, but the film is full of stuff like this, cause it’s not real, it’s a film and you can get away with anything. And I think you get that when you watch it – this isn’t real! 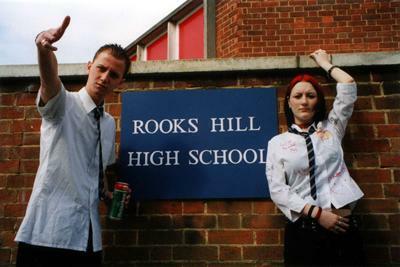 That thing about the schoolgirl and the crack, in real life it’s awful but in this film it’s well funny! And because we had no financial backers to please, no restraints when we made that film we filmed stuff we wanted to see. And that’s what makes it so much fun for a young audience to watch, cause they know they wouldn’t be seeing anything as ‘un-pc’ as this anywhere else. I might add though there is no swearing in the film – we’re not trying to shock, just to be funny and I’ve always found made up swear words to be much funnier then the real things. At the moment I am putting the finishing touches on a new feature film called Dark Hunter which I’m making in collaboration with two other filmmakers, Duncan Cowan & Johnnie Oddball. It’s a horror/comedy and it will be premiering at the Curzon Mayfair cinema in London in July 2003. We’ve had a lot of interest in the film from various places including the BBC so fingers crossed for that. On the slate I also have a sci-fi thriller I hope to begin shooting this year called The Calling for which I have shot a trailer which can be viewed on my website http://www.jacksonfilm.co.uk. This is a film for which I’m quite keen to try and get some backing because I think it could have a real audience this time. I’ve learnt a lot how to make films since Ninja Man and my approach will be a far cry from that early effort. I’m hoping The Calling will be my breakthrough piece. But if I can't get any money then I’ll just get a bank loan and pay for it myself. Trailers for Ninja Man, Dark Hunter & The Calling can all be viewed on Mark's website, along with online journal and all sorts of other goodies. Ninja Man has recently been added to the Internet Movie Database.